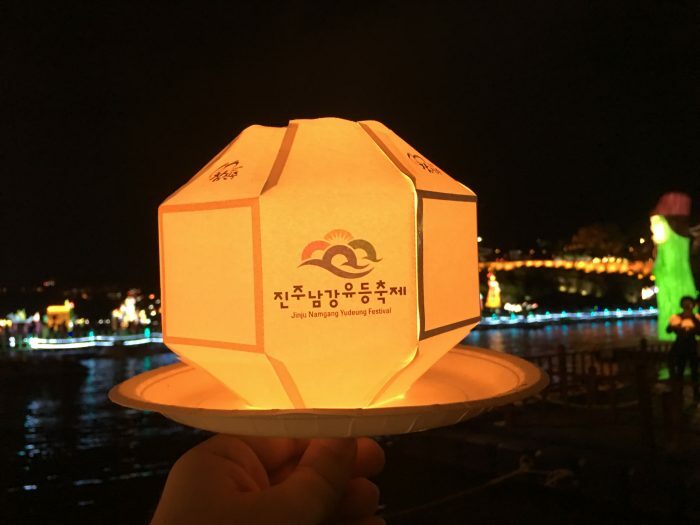 There are several lantern festivals in South Korea each year, but perhaps the most famous is the Jinju Lantern Festival (full name Jinju Namgang Yudeung (Lantern) Festival. 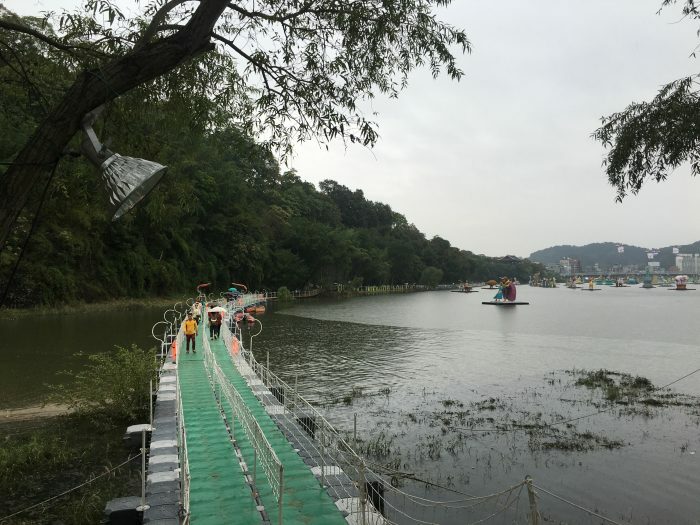 Each October, hundreds of thousands of people flock to the city of Jinju in southern South Korea to see the Nam River come to life. The festival has ties to the military history of the area, where several battles took place against the Japanese. 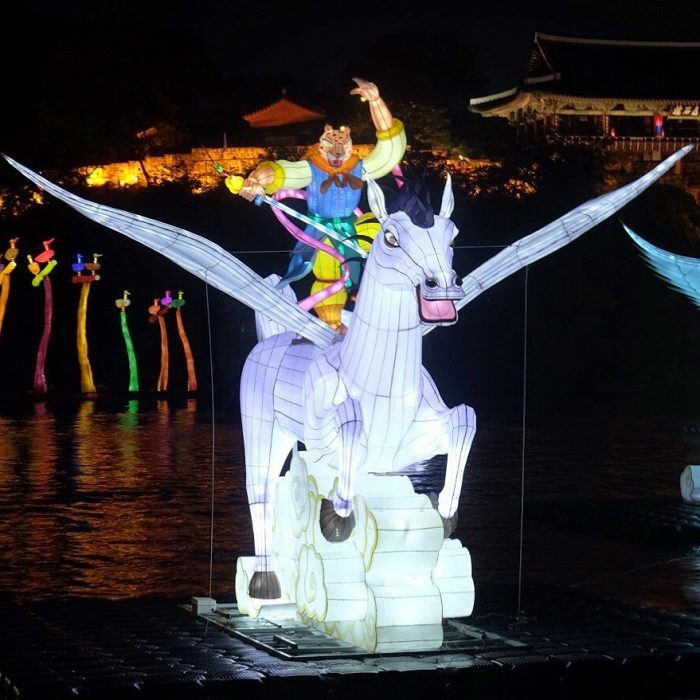 Along with dozens of lit inflatable balloon displays, the Jinju Lantern Festival also sees thousands of lights placed along the city’s bridges & Jinjuseong Fortress. And of course, the festival wouldn’t be complete without visitors sending lanterns marked with wishes down the river. 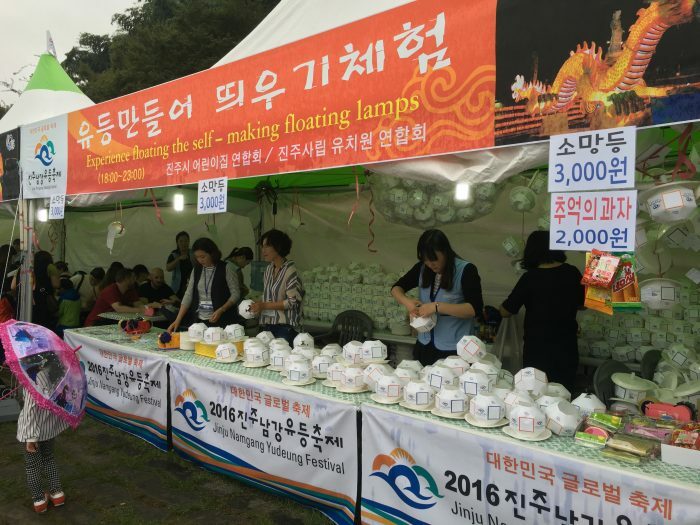 I arrived in Jinju the evening before the 2016 Jinju Lantern Festival began, so I could have a couple of full days there. I stayed in a love hotel called the Greece Hotel, right along the Namgang. One interesting thing about South Korea is the preponderance of reasonably priced love hotels that are perfectly fine for anyone to stay in, as long as you’re not weirded out by the concept. I started my morning off with a walk along the river. Setup was still underway. 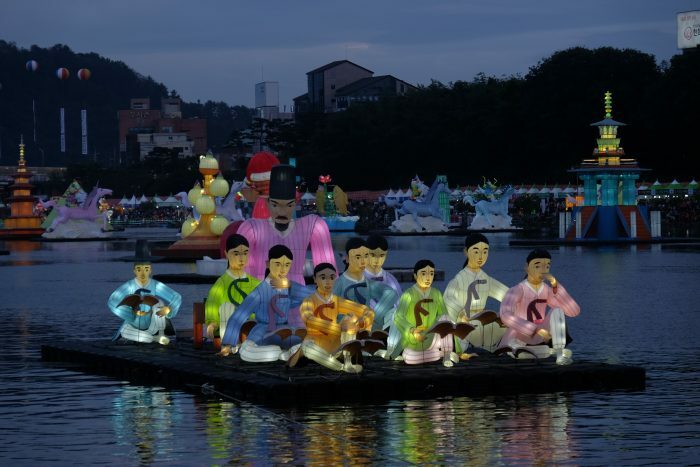 The nature of the Jinju Lantern Festival means that it’s a nighttime event. However, that doesn’t mean there’s nothing going on during the afternoon once it’s open. 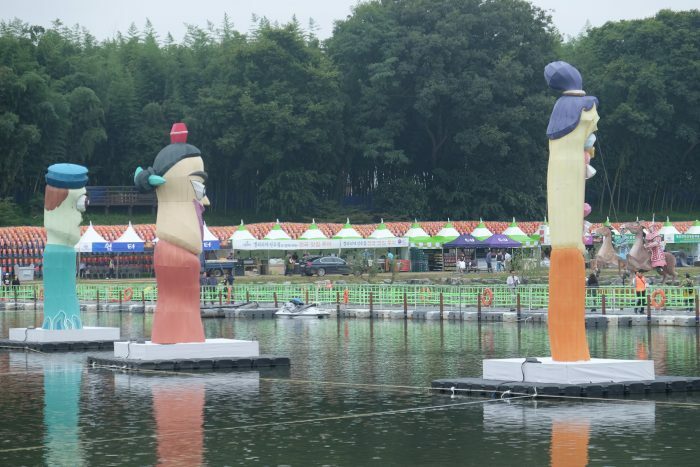 There are several other associated events in Jinju during these weeks, including the Korean Drama Festival. Families were also out walking, enjoying the inflatable displays even though they weren’t yet lit up in the dark. The festival is quiet early on, but still worth seeing in the daytime before the crowds arrive. 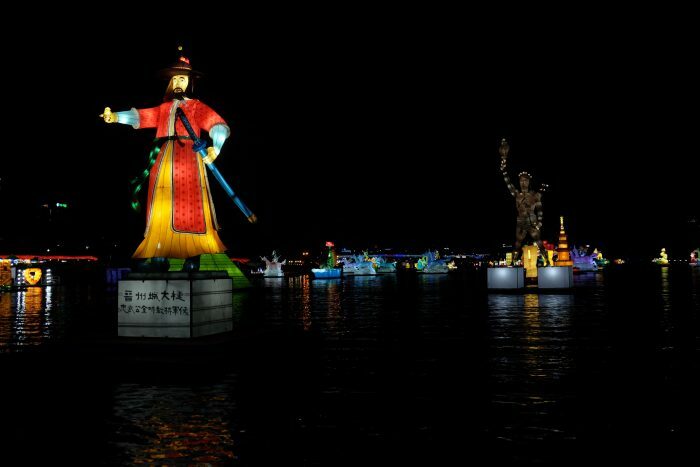 Entry to the Jinju Lantern Festival costs 10,000 won. You get a hand stamp so you can go in and out all day. After checking out some of the bankside displays, which included statues promoting other festivals, I headed into Jinjuseong Fortress, the massive complex dominating the town. Entry was free to anyone with a ticket to the lantern festival, as it is part of the festival grounds. 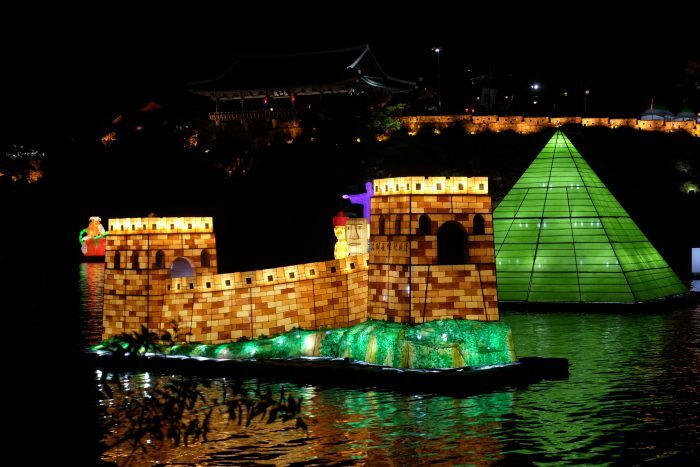 The Jinjuseong Fortress is the highlight of Jinju. It’s a must-visit if you happen to be in the city any time of year. In reality, when the festival is not going on, it was probably the only landmark of note. You can read more about my visit to Jinjuseong Fortress here. After spending a couple of hours exploring the fortress, it was starting to get into the late afternoon hours. I headed downhill back toward the main part of the festival along the riverbank, passing food stands, and even a temporary convenience store. At the northern end of the festival grounds there is a musical fountain, which unfortunately wasn’t active during the festival itself, but it still had several colorful displays set up around it. People were taking photos around the displays, which included one dedicated to China, as well as several dinosaurs. This area also had a food court dedicated to Foods of the World. Vendors included Turkish ice cream, Russian shashilk, and German sausages. The skies had been gloomy all day, but it finally began to rain. I took shelter under an information tent with a bunch of people while we waited for it to subside. 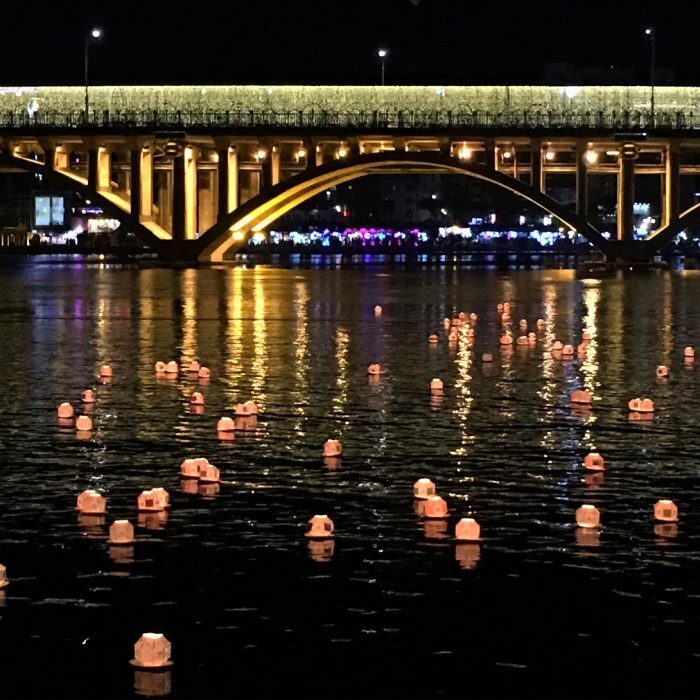 In addition to the city’s existing bridges, which are covered with lights for the Jinju Lantern Festival, there are a few temporary floating bridges that are set up. These bridges are close to the displays, making them crowded at night once everything is lit up. I was able to cross over to the south side with minimal queueing, since it wasn’t yet dark when the rain stopped. This other side of the river is where the bulk of the visitors hang out.There are even more temporary bars & restaurants here, along with performance stages. The Jinjuseong Fortress makes for a dramatic backdrop. 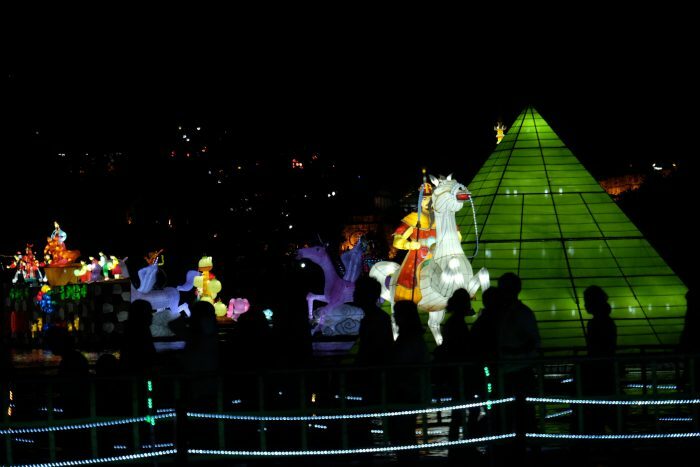 You can also take a boat ride along the river to get an even closer look at the displays. The food selection was truly international. 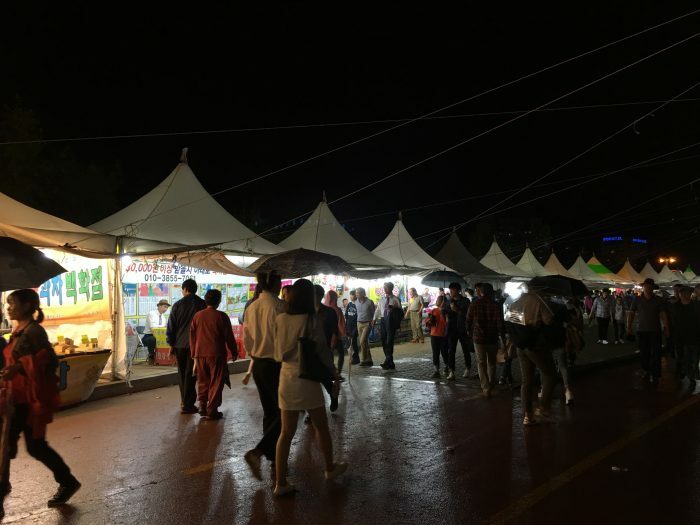 In addition to the same stands that I had seen on the other side of the Namgang, there were also crepes, hot dogs, churros, waffles, takoyaki, and, representing the United States, corn dogs. However, these were not just any corn dogs. The corn dogs somehow had chunks of French fries in the batter, which is an amazing innovation. Behind all of the tents & below the hillside above, there is a tunnel of lanterns. People can purchase lanterns that become part of this display. By now it was starting to get dark. 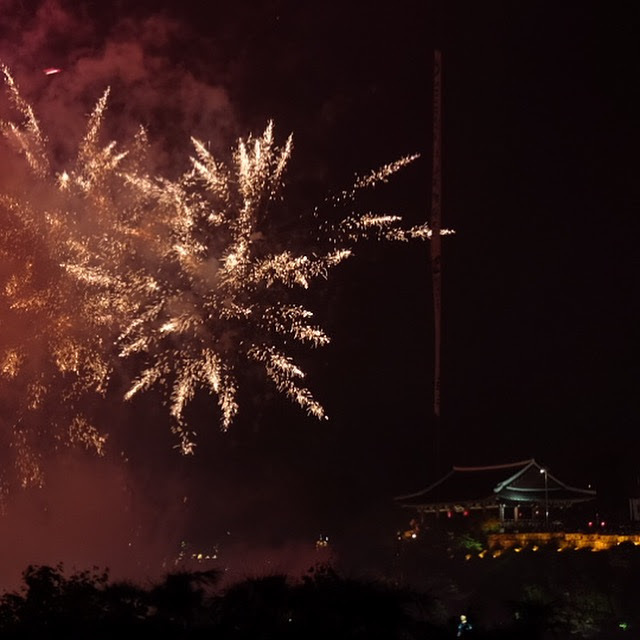 The highlight of the first night of the Jinju Lantern Festival is the fireworks display. Since this is the only night with fireworks, it’s the most crowded night of the festival. I headed up into the hills to try to scout for a good spot to take photos of the fireworks show. Of course, the weather was still grey and foggy. I finally found a spot that was hidden that people didn’t know to go to, but there were already some photographers there an hour and a half beforehand. This area of the hills above the festival is actually a park that is closed off to outside access. There was one staircase up to it from inside the grounds, but nobody really knew it was there. I finally found a good spot overlooking everything, one with panoramic views at a railing, and sat down to wait. It started to rain again about 40 minutes before the fireworks. While I waited, I caught a parade with local floats & music passing behind me on the other side of the fence. I wondered why other people weren’t coming up, since it was a great spot to see the fireworks over all of the lights. Then I saw what had happened. The way I had come up had been closed off to the public. I was now trapped in the park, but at least I was up there. About 15 minutes before the fireworks, the rain stopped, but there were still low clouds. I’d already come to terms with the fact that this was going to be terrible weather for the only night of fireworks. About 2 minutes before it started, a flood of people realized they could sneak into the park, but there was still plenty of room. Finally, the show began. It was a nice fireworks show, lasting about 10 minutes in total. Unfortunately, the low clouds trapped the smoke close to the ground, floating it towards us. Unfortunately, as you can hear in the video, some geniuses thought it would be a good idea to bring their dog to a fireworks show. Please don’t ever do that. Dogs should be kept safe at home rather than being exposed to noise that scares them. After the show, I climbed back into the main area to the festival through a gap in the lantern tunnel along with everyone else. During the hour and a half that I had been waiting for the fireworks, the festival had become much more crowded. At this point, everyone was trying to cross the river to see the floats. It’s a good idea to stay put or find somewhere away from the bridges where you can still enjoy the view. 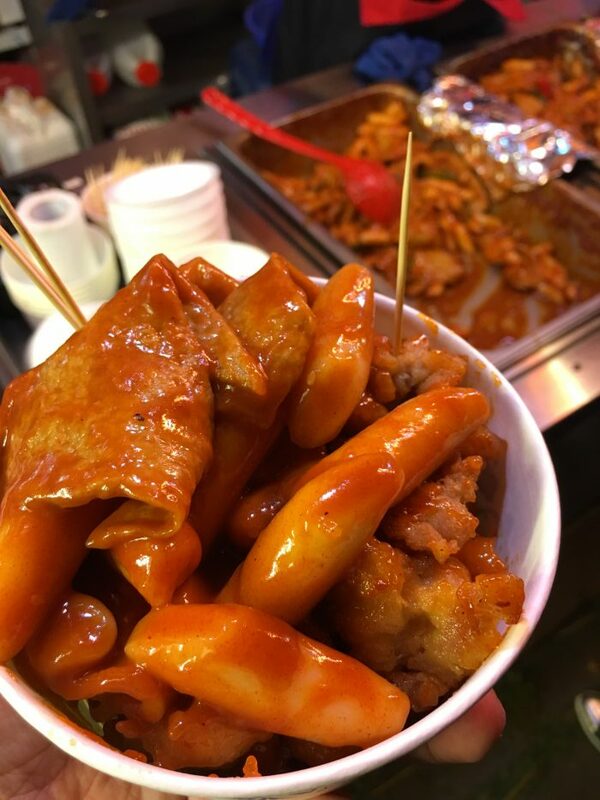 I sat along the river watching the Jinju Lantern Festival crowds & the lights while eating some Korean fried chicken & tteokbokki, which are stir-fried rice cakes in a spicy sauce. It was time to slowly start heading back to my hotel. I continued underneath the main bridge spanning the festival into an area that had more food, plus arts and crafts tents. Watch out for the low hanging decapitation wires here. 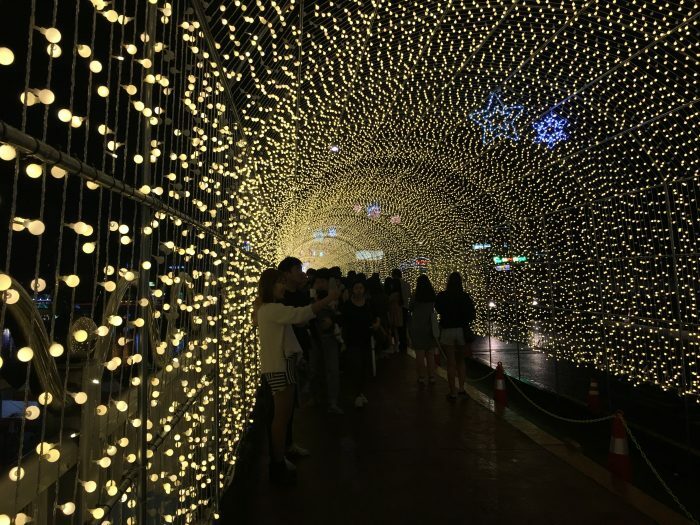 Realizing that I needed to get back across the Namgang, I headed up to the bridge, which had been converted into a tunnel of lights. It was a beautiful sight, with nice jazz playing on the sound system. Lots of people were taking selfies here, but I couldn’t blame them, it’s a notable sight, especially for couples. 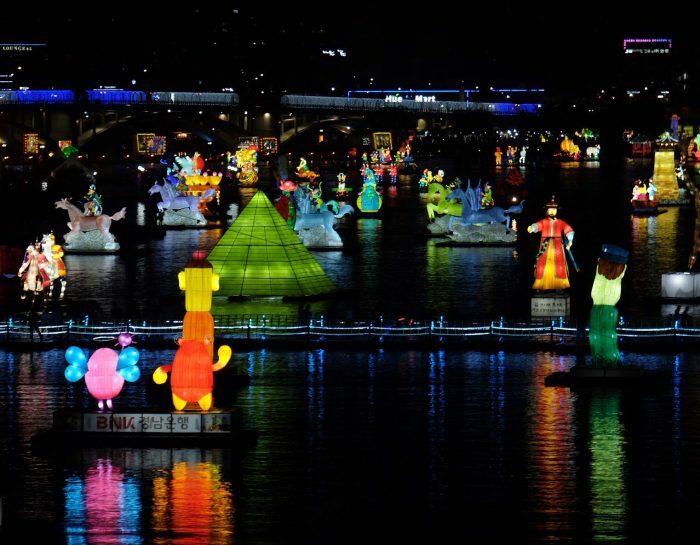 In addition to the lights of the bridge, there’s also a nice view of the festival along the river below. Back on the same side of the river as my hotel, I walked through the Korean Drama Festival area. With more rain falling, there weren’t many people. A lone guy played a guitar on stage with almost nobody watching. Of course, it was right outside my hotel window, so I listened to him close out the night. 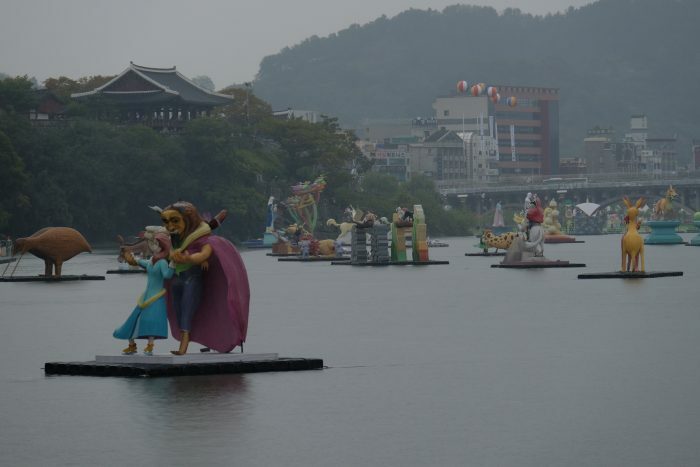 On day 2 of the Jinju Lantern Festival, I started off with a walk around Jinju. The city has a nice street market, though it was quiet on a weekend, even with visitors in town for the festival. Instead, I had lunch at a place called Sinpo Woori Mandoo. 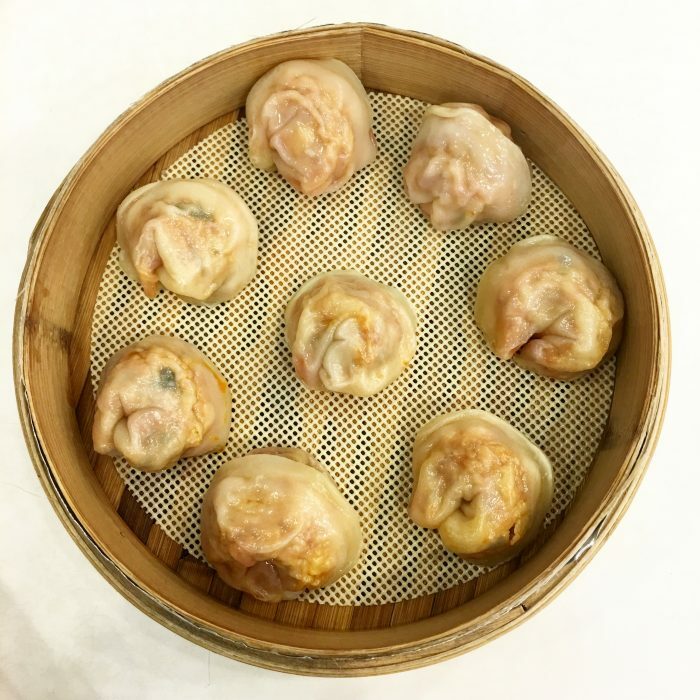 It’s a Seoul-based chain of restaurants that’s known for their dumplings. I had the kimchi mandoo, which consisted of kimchi, pork, and vegetables, along with haemull tomato dupbap, which is fried rice covered with an omelette, seafood, and a tomato-based sauce. After eating, I visited the rest of Jinju Fortress, since I hadn’t seen everything the previous day. 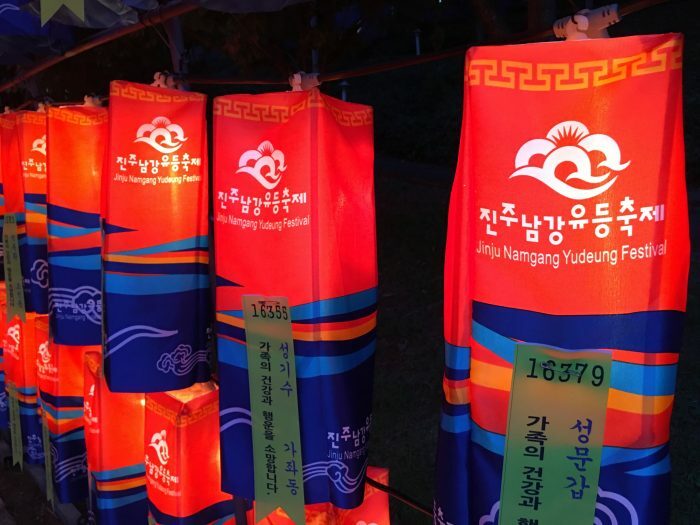 Not that I tried to get in with my previous day’s hand stamp, but the Jinju Lantern Festival uses a different colored hand stamp for each day. The weather wasn’t much different from the previous day. It was even warmer, but still grey and gross. I took advantage of the fortress museum during a rain shower. Once this rain passed it was finally much clearer. By this point it was now 5:30pm and getting dark soon. I walked down below the fortress on the north side of the Nam River. This side is much quieter since access is more difficult, and there are fewer festival amenities. 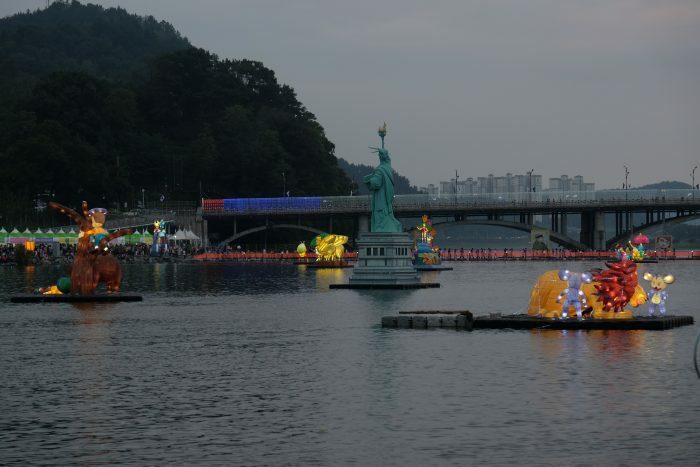 The path along the shoreline afforded a nice view of all of the festival floats. The floats all have different themes. Some are Disney cartoon characters. Others are themed for countries around the world. The Statue of Liberty was the only one that was not lit up. Perhaps this was foreshadowing the upcoming election. Part of the north shore has a floating bridge. Here I found myself back at the fountain area where I was the previous night. I then waited in the long line to cross another floating bridge to the south shore. 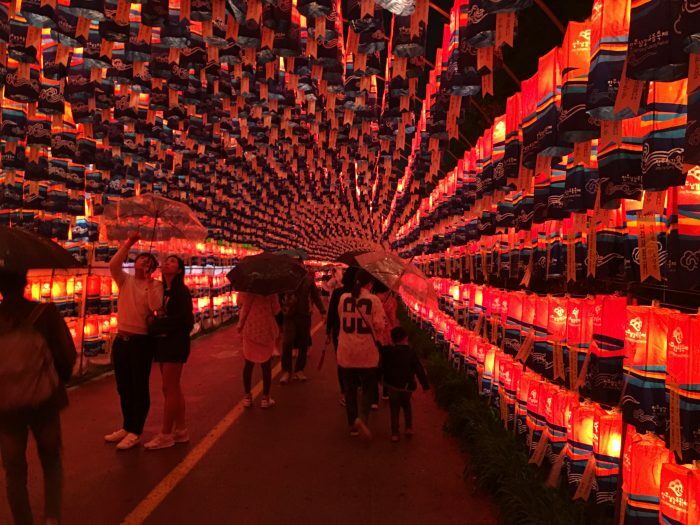 Although the line was long, the crowds were smaller on this 2nd night of the Jinju Lantern Festival, since it didn’t have the opening fireworks and the weather was bad. I made my way across, legs wobbling. It takes a bit to get your balance back after you’ve walked across these floating bridges. 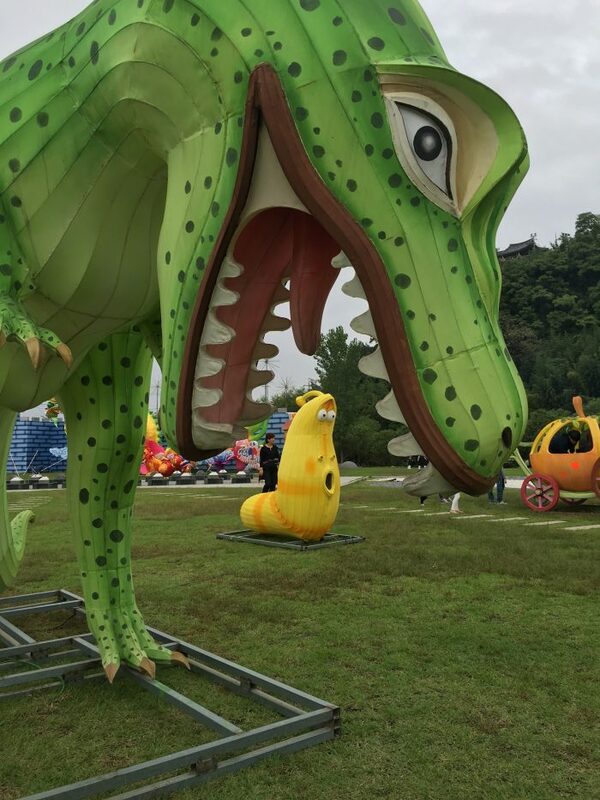 Walking along the river again, I passed a fire breathing dragon that hadn’t been in operation the previous night. I found myself at the pier where visitors launch lanterns with wishes on them. I purchased one for 3000 won & got my instructions from the women running the booth. You write your wishes on a simple paper lantern that holds a candle, then float them down the river. I wrote 3 wishes on my lantern, then said goodbye as it floated away. I won’t tell you what my 3 wishes were, but one of them definitely did not come true. Foreshadowing, and all that.